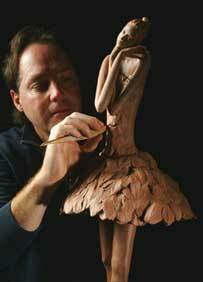 David Pearson begins creating his original sculpture, usually in Chavant oil clay. He takes his inspiration from ancient civilizations, the human figure, nature and the birds around him. 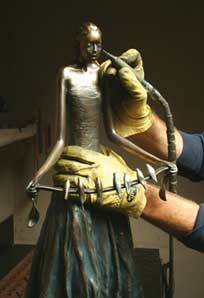 Once the original sculpture is complete it is ready for the bronze casting process. To give a little background, David's studio is out on 20 acres south of Santa Fe. Here he has several different rooms, a sculpting room, a wax room, a chasing room, and a patina room making up his own personal foundry. The only processes he doesn't do at his studio are the gating/ dipping/pouring processes. The lost wax process David uses dates back centuries and is the traditional casting method used by foundries all over the world today. Following are the seven steps David uses to cast his work. Making the mold begins with silicone rubber meticulously painted directly on to the clay original. This is to ensure that the exact surface of clay is picked up in minute detail. This rubber coating is built up four layers thick. Then a plaster mold is made over the rubber in three or four layers until it is approximately 1 inch thick. Once dry, the mold is cut in half, creating two sections. On complicated molds there may be three or four sections. This completed mold now becomes David's "mother mold" that will be used to create each piece in the edition. The clay original is destroyed. The wax is the second positive of David's original. David paints in a special layer of wax heated to 215 degrees to once again pick up all the detail of the original and ensure there are no bubbles. Once both halves are ready, he closes up the mold and slushes the mold using a completely different hot wax at 190 degrees. As the wax cools over the next several minutes it will build up to a thickness of 3/16". At this point the mold is turned upside down and the excess wax is poured back in the large pot. Many hours later after the wax has hardened, he very carefully pulls the two halves of the mold apart and removes the wax. The mother mold is now put into storage to await the next wax. David pulls each wax as that particular sculpture sells. This ensures the highest quality of each piece in every one of his editions. Now he begins the long and extremely detailed dressing of the wax. He takes out all the seam lines from the mold and painstakingly goes over every face, ear, hand and foot to ensure that the wax reproduction is as close to the original as possible. After David has finished the dressing, he then takes the wax to the foundry. THE THIRD STEP - PREPARING FOR CASTING - "GATING" and "THE DIP"
The wax is prepared for the ceramic shell. It is gated using wax rods attached to the wax sculpture. A pouring cup or funnel to accept the molten bronze is attached to provide a path for the hot liquid metal. Now the wax is ready for the dip. Dipping the wax with all of its gates into a liquid ceramic solution is the second mold in the process. This is a layering effect involving dipping and coating with sand approximately 7 to 12 times depending on the size of the sculpture. Each layer must dry thoroughly before the next dip. 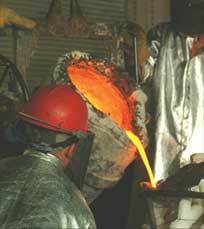 The ceramic shell is incredibly strong in order to hold the weight of the hot liquid bronze during the pour. Once the shell has dried with its final coating, it is then put into an oven. At 1200 degrees the wax melts out - thus the term "lost wax". The ceramic shell is now hollow and ready for the pour. After the ceramic mold has been inspected for cracks and repaired from the burnout procedure, the mold is pre-heated in the same oven to 1900 degrees. This firing takes the ceramic shell to its highest level of strength in order to accept the molten bronze at 2000 degrees. 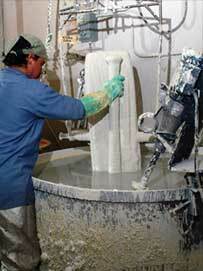 After the bronze is poured and cooled, the ceramic mold is broken and the bronze is removed. The majority of David's work is cast in several sections. So now the refining begins. He removes all of the gates used during the pouring process. Plugs are welded back in place. The different sections are welded back together and the re-surfacing of all textured and smooth areas takes place. This is time consuming and physically demanding work! This is the final stage - the art of color. It is one of the most important stages in the completion of any bronze. Using chemicals and fire, David applies the liquid with a brush to the heated bronze. Going back and forth between chemical and heat is what creates the patina. After decades of experience, David has a very unique vision for his patinas. In the beginning, while sculpting the original out of clay he visualizes how the patina will be. Different surfaces from smooth to textured will accept different chemicals. The knowledge of what will work best is something only years of experience can offer, and one only receives such an education after decades of work in the foundries. David is considered by many in the casting profession a patina master. It is his dedication to excellence–being involved in every step of the process that takes his work to a higher level. He works on every wax, making sure every detail down to the ears and the eyelids is perfect. He finish chases every bronze to make sure the skin areas and textured areas are perfect. He patinas every single piece in every edition to make sure it is exact! He is hands on with every bronze, which is extremely rare among sculptors. This is what makes each and every David Pearson bronze sculpture so superior in quality and excellence. His work is not run through a factory process. Every piece is individually created by him, for each special client. And this explains the two to three month casting process. Each piece in his very small editions, (ranging from nine to 15 and never greater than 15) is created individually for you! Please call Patricia Carlisle Fine Art Inc for David’s beautiful four color brochure, How a Bronze is Created.